The Helmet Mini Tank is a 2ml leak proof stainless steel clearomizer with a classic appearance and a 510 threading for an overall universally loved tank. 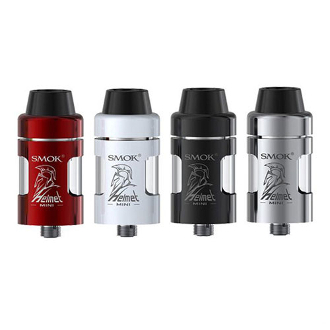 This Tank comes with a 510 drip tip attached and has a v shaped airflow channel that increases the amount of vapor and keeps the mouth piece cool while vaping. The Helmet Mini has a top pressure spinning design to open and close its top cap which classifies it as a child proof device. This also means you can fill this tank through the top for a worry free and mess free refill. It also acts as an air flow control system with air slots that can be closed and open at the user’s whim. The opening and closing of these air slots helps regulated the air flow being brought in and the resistance. Once the top cap has been spun off the coil stays attached and both pieces will come out. No liquid dumping necessary while changing your coil as it is easy to grab and maintain for clean flavor and maintenance. The Tank is advertised as being leak proof with a “U” shaped tube that keeps the e liquid totally enclosed without any chance of seeping out. Plus its body being made of stainless steel helps the user avoid the casual wear and tear and keeps it relatively new looking and shiny!